Yesterdays project was to use up some scrap glass from my scrap bin. This fish is what i came up with. I fused it at 1375 to retain some dimension. I like it this way for an art display piece but probably would fuse it full fuse for a platter. Hard to decide on which one to do. This was from the day before the fish. 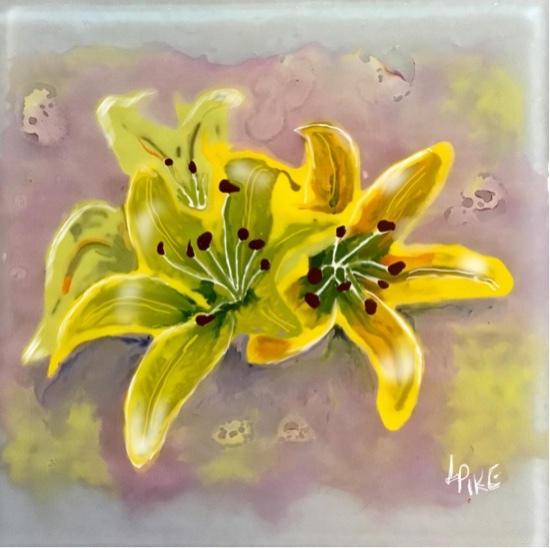 This is another 6x6 piece painted with Color Line Enamels. It took 2 fusings to get the artwork the way I wanted it. Now one more firing to slump into a square dish. It will be food safe and 100% glass. An update......This is the piece after slumping. This is my newest project. A scene from the "Valley of the Fire" Nevada. 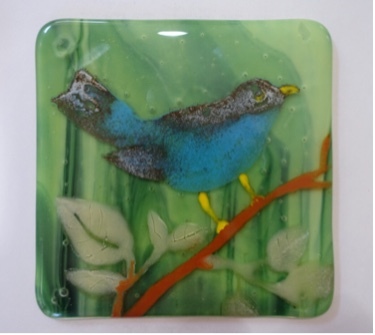 The photo above shows the steps I have taken so far to create this painting in fused glass. 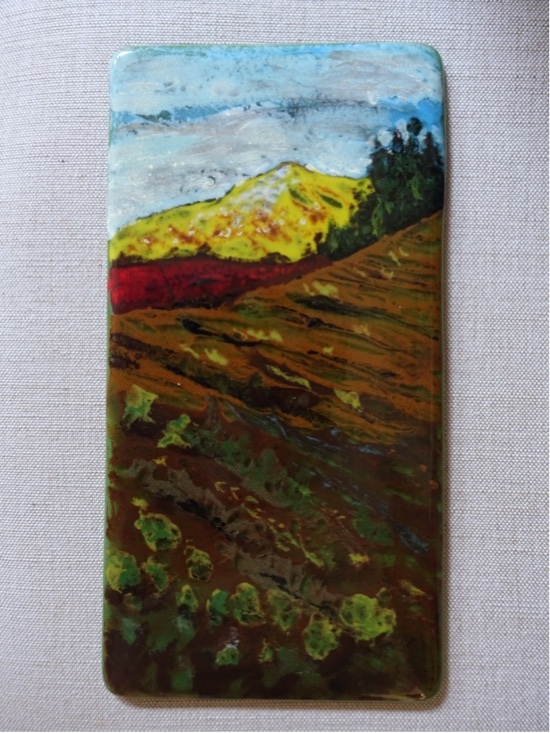 It is in the kiln right now for its third firiing after the third layer of color was applied. Tomorrow I will update this post with the results. 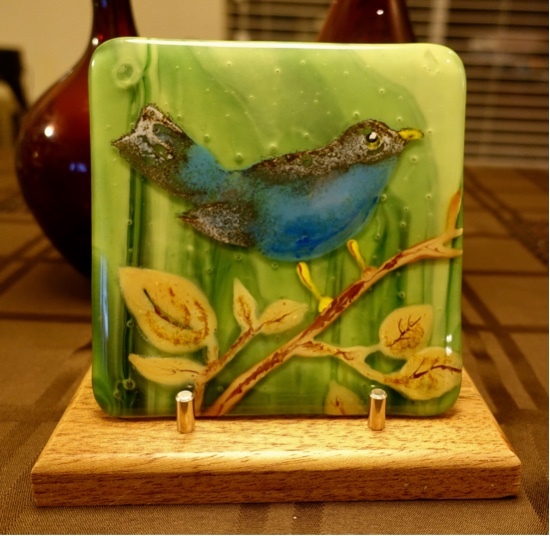 Here it is....out of the kiln and I think its done. Have to take a second look at it in the morning. This was the second test piece that I decided to try adding color to the back side. I painted the clear areas with ColorLine paints and then sifted glass powder over the whole thing. 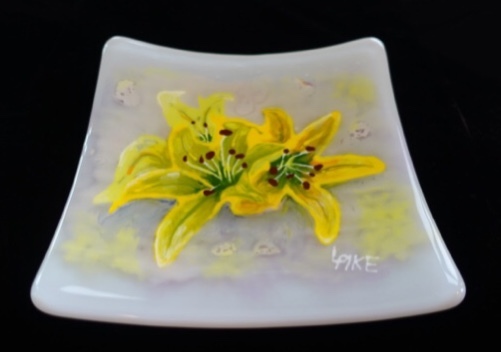 I sprayed with hair spray and dried it in the household oven and refired in the kiln. I fired it bottom side down with the new color so the top would stay shiny. Well I added more color using ColorLine paints. I'm still not happy with it. The bird is ok but the branch is a bit distracting. Should have left it alone. Now all i can do is paint over it with a lighter color and refire again. The leaves could use another layer of paint in the lower right corner. The bubble in the top right corner that I drilled out did smooth out and fill in but it still left a circle shape in the design. Its is more acceptable now. I may fix the branch and leaves and fire one more time then slump into a 6x6 sushi dish. 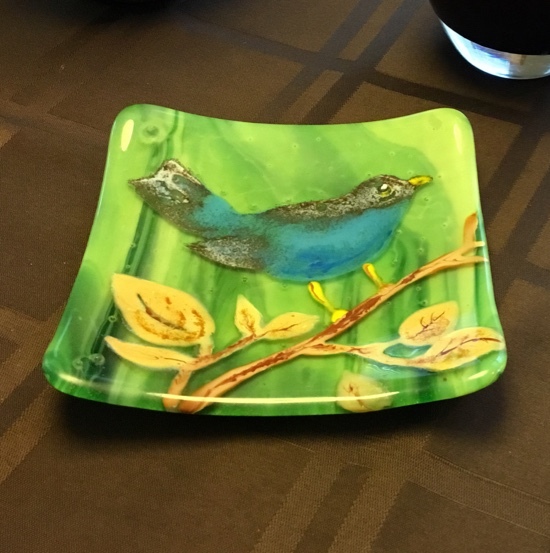 Here is the piece fired the third time. The colors are much better and the branch and leaves have more interest. I still plan on slumping into a sushi plate. This photo was taken at night with lights on so colors are more vivid. It has been slumped now and I am glad I made it into a dish. It has even more character now. 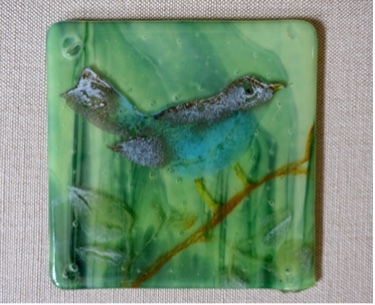 Glass Fusing Gone Wrong or Not? This top photo was a real surprise when I opened up the kiln. The objective of this test was to create clear holes that see through to the base layer. 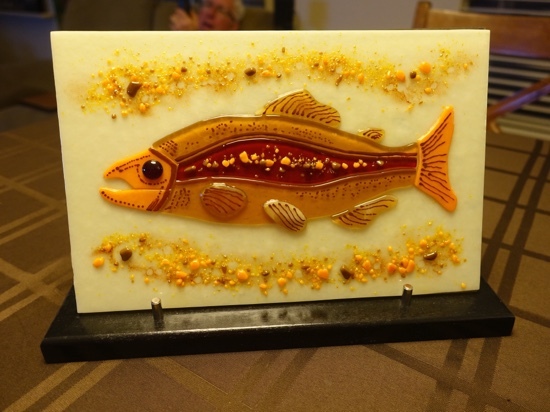 I used aloe vera gel and glass powder to create the design on the base layer and added a big piece of clear ice frit under the area where the see thru was. I oven dried the aloe paints in my home oven at 225 degrees. Next I created the top layer by sifting black powder and lifting out the see through circles. I added a bit of brown powder around each hole. Next I placed a large piece of clear glass frit at each corner between the layers hoping to allow bubbles to escape during the full fuse. I use the Bonnie Glo fiber kiln in which you can fire at faster schedules if you want to, with good success. So I used the medium fast schedule they provide. 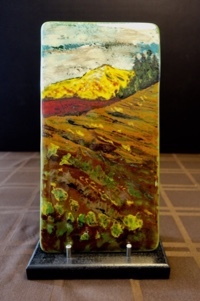 In my previous project using aloe vera paint I prefused it first then added more paint on top and added a base second layer of glass and full fused again. In this project, not thinking well, I fused all the layers at the same time. MISTAKE! You can see this test was supposed to be a 4.5x4.5 square piece but the bottom layer cracked and spread apart. Dah! I think the aloe vera gel gases had no where to escape to even though I put large frit in the corners to seperate the layers to create an escape. I am figuring that the fast ramp did not give it enough time for the escape of the gases so the photo is what I ended up with. Just to not give up on the piece of glass I am adding some paint and powder to the bottom side and am going to fuse it one more time. 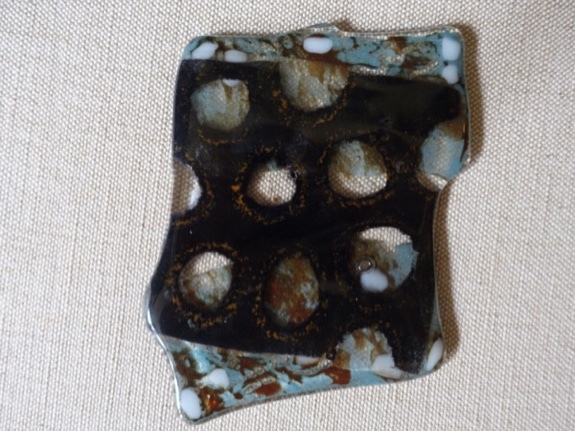 I may be able to cut it up and use it for jewelry or add it into another arty collage fused glass piece. 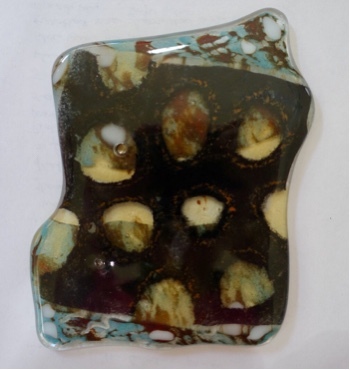 I am also going to try the experiment again firing the two pieces seperatly before full fusing them together. I am intrigued by the idea of seeing through the holes to something below on the base layer so stay tuned for that in the future.. This next piece with the bird also had some problems. It was fired along with the piece above. I also put large clear frit pieces in the corners to allow bubles to escape but again one of the corners turned into a large bubble. I have read you can drill a hole in the bubble and refuse the piece and the air should escape. We shall see if that works after a second firing. Also not thinking, the leaves of the branch were put on as light green powder using a stencil but after firing they disappeared because I decided to use the streaked green base glass. So now I have painted over them with the colorline paints. The bird came out interesting in that I used blue powder with some french vanilla powder sifted in areas over the blue. When fired I had forgotten that the blue and the vanilla would have a reaction and thus created some brown areas. I really liked the effect it created. I will remember this effect for future projects. I added some more blue paint and brighter yellow on the beak and legs, and will fire again today. Also before the first firing yesterday I lightly sprayed the piece with White Rain Hairspray to keep the powder in place. But the spray comes out of the bottle in little uneven droplets and I think some of the texture in the bird was created by that. But again I like that texture. 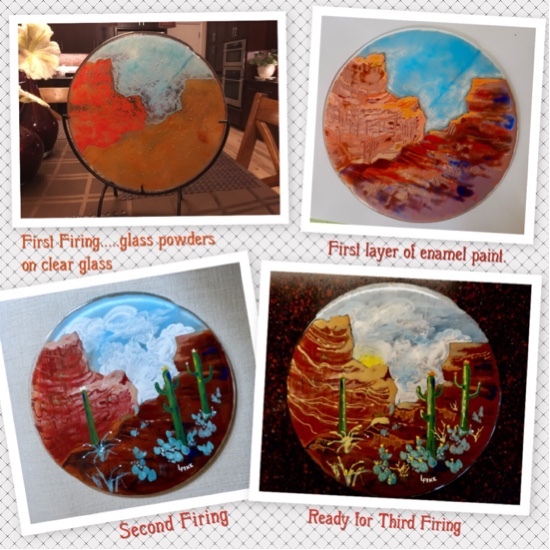 Stay tuned for the second firing results. Happy Fusing! This is Mount Shasta in Late summer at sunset. 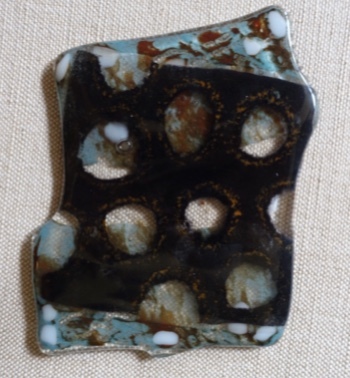 It is 6x12 100% fused glass. 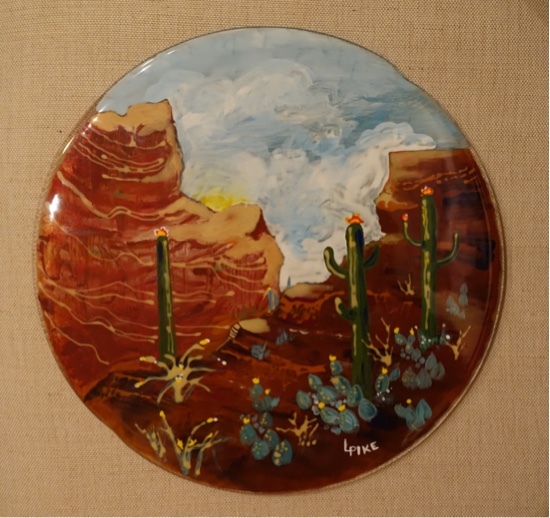 It was painted in 2 layers and fired twice. I was quite happy with the painterly effects. It fits into a metal stand for display. Email me at lpcolor@sbcglobal.net for price and purchasing info. This is also White Tank near Phoenix Arizona. Does this make you want to take a hike? This is a 16x20 acrylic on gessobord. 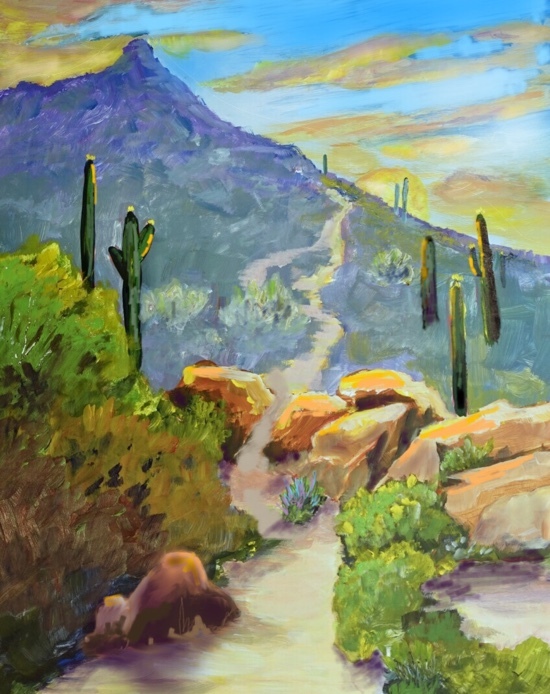 The rocks are my center of interest but then i want you to slowly continue you journey through the rest of the scene.